Each daily fantasy sports site offers free money sign up bonuses. Check out all of our reviews of every site to see each site's bonus. Yet, each site caps the limit on your bonus up to a certain amount. By using multiple DFS sites, you can take advantage of more than one bonus which equates to more free money! More free cash! Most sites offer freerolls and you want to get in these for obvious reasons. Enter every single one you can. It's risk free money if you do well. If you take the time to sign up at all of our recommended sites, you can be entered in over 20 freerolls a day without even making one deposit. It's fun, it's free, it's a no brainer. 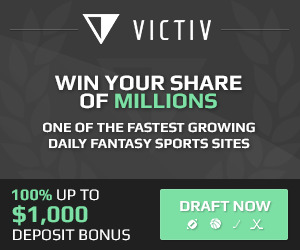 To find a full list of the best DFS sites online, look in the upper left menu here! We all have our preferences as to which games we like best and which games have the highest expected value for us. This is why multiple daily fantasy sites is a smart way to have any type of game at your disposal. We, at Rotopicks, love snake drafts, and you cannot find them on the two major daily fantasy sites, DraftKings nor FanDuel (They offer them at Draftday). You may also like Pick 'Em games, which are not on all sites, or even just like diversifying your matchup portfolio. Even more importantly, you want to have access to all of the GPPs (Guaranteed Prize Pool) tournaments because for each sport, each site typically has at least one huge tournament. We've seen prizes as high as first place paying out one million dollars! So, you would at least want the option of entering a million dollar tournament when it is offered on a site you are not yet a member of. The level of competition is different on different sites. From experience, the newer a site is, the easier the competition. So, since many of the sites we promote are new, it is advisable to check them out and at least try some head to heads or double ups. You probably will not even have to be on top of your game to have some good results. Over time, if you track your gaming well (and all sites have your history and game logs), you will learn which sites you do best at. Once you've exhausted all of your bonus opportunities, stick with what works! Another important aspect of having access to multiple daily fantasy sites is that each site makes their own salaries for players. It is not like the stock market with one universal price per commodity. So, if you like a few particular players, it is smart to browse through as many sites as possible to find where they are cheapest. You would be surprised at how vast the differences in salaries are at times across multiple daily fantasy site platforms. Hey, things happen. If you are only a member of one daily fantasy site, you have nowhere to play if the site shuts down because of a glitch or a server problem. The site may even be bought out by another company. You want to get started as soon as possible signing up to different sites, get used to their formats and games, and become fluent across the landscape that is DFS.